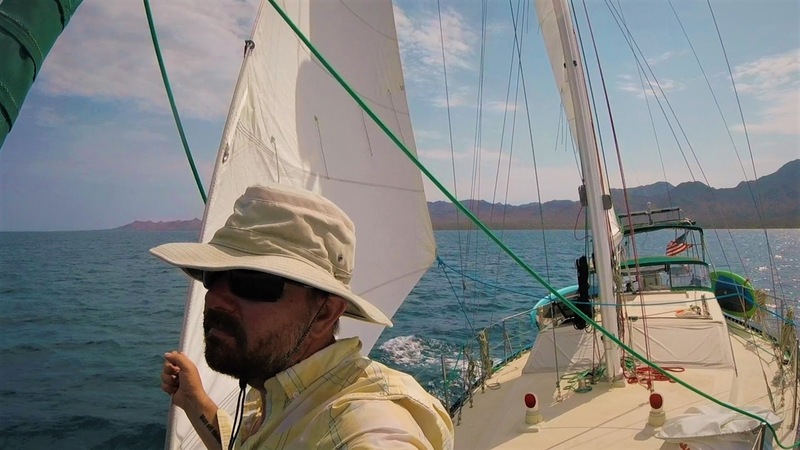 Before we came to Mexico, we had heard from other friends and sailors who had spent the summer in the Sea of Cortez, riding out hurricane season, who warned us that it was going to be hot. We heard people use some creative descriptions for hot, some of which I probably shouldn't repeat in mixed company, but creative to say the least. “It's hot as hell-fire and damnation!”, “It's so hot you'll melt your brain!”, and my personal favorite now that we are here and experiencing this place and can fully understand and appreciate the gravity of it's meaning, “It's balls hot!” (this last phrase was told to us by a girl, who by the laws of physics, math, and science, does not personally have a set of jewels, but she still somehow manages to grasp the full and heavy weight of it's meaning). We are currently anchored in a little bay called Playa el Burro, which is in the larger bay of Bahia Concepcion on Mexico's Baja Peninsula. 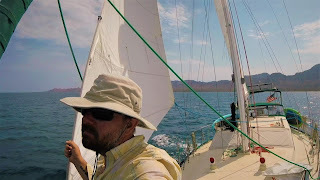 In our research, and from listening to some other sailors, it's been reported that Bahia Concepcion is one of the most beautiful areas to cruise, and unfortunately, it's also one of the hottest areas on the Baja during the summer months. Since we've been in Mexico for close to 9 months now, my assumption was that we've gotten accustomed to the heat. We've been in places in southern Mexico with temps in the 90's and humidity hovering around 90%, where sweat dripped from everywhere, and I do mean everywhere, and also where I'm sure the aforementioned phrase originated. We've been in other places here on the Baja, where 100 plus is the norm. But, the places we've been so far all had one thing in common - the water. It was always cool and refreshing. We could jump off of the side of the boat and bask in the water's glory, cooling our core and forgetting that our brains were melting just a few moments earlier. Knowing that Bahia Concepcion is one of the hottest areas in the Sea, and with the cool water in mind, I figured this place would be no match for us. We could jump in the water at any point and come out refreshed. Here in Playa el Burro, the water under out boat is a whopping 91 degrees. You read that right – 91 degrees. That's surprisingly not the bad news. Even though 91 degrees feels like jumping into bathwater, it's a lot cooler than the air temperature here, which makes jumping in the water feel almost refreshing – almost. Just so you fully understand what I'm about to tell you, I'm going to spell this out for you, just to let the number sink in. The air temperature today was a whopping one hundred and seventeen degrees. 117!!! Holy crap that's hot! That's officially balls hot! But the good news is that last night the boat cooled down to just over 100. Oh wait, that's not good news either. As I was laying in a pool of sweat last night, trying my best to sleep, all of the sudden Mexico went from a place that I couldn't get enough of to a place that I hated. Rage was setting in. My brain was being cooked and there was nothing I could do about it. I thought about taking a cold shower to cool off, but sadly, since it's so hot here, our cold water isn't cold. It's bathwater warm. We have numerous fans on the boat and a little spray bottle that we keep in the fridge for a cold water spritzing. The trick is to strip down, spritz, and then sit next to a fan, but even that wasn't keeping up with the heat. The spritz and fan trick was only about 3 seconds of relief. Brenda and I have always talked about the possibility that Mexico's summer heat would be unbearable - mostly for me. She doesn't really have a problem with the heat. What we have discussed is that if it is too hot and miserable, we could store the boat and go somewhere cooler, just until summer was over, and then return to the boat and continue cruising. Last night, as I sat and stewed in my sweat, I dreamed of all of the places we could go that were cold. South America was sounding pretty nice. It's winter down there after all. 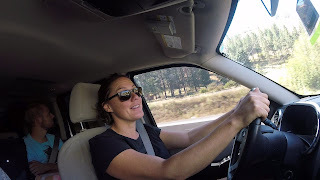 But, since we are in a place with no internet or cell service, I couldn't research the places we could go. No looking up plane tickets, hotels, or things to see – just stewing. 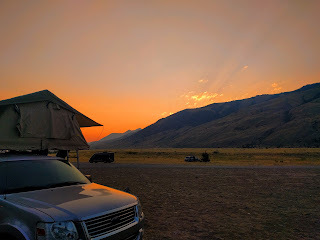 It was one of the few times where we've been off the grid that I wished my phone worked. Even if I did nothing more than look at a distant place with snow on the ground, I really wanted my phone to work. I guess I should be perfectly clear and say that there is still hope for me. We are currently in the hottest area of the Sea of Cortez. In another couple of days, we'll be in areas that are much more tolerable – with temperatures hovering around 100, but with ocean water that is much cooler and more refreshing which all of the sudden makes Mexico great again. But until we get to those more tolerable places, I have just a few words of advice for you. 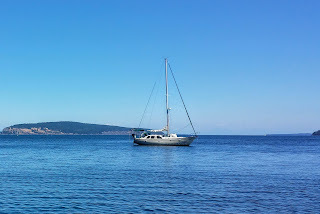 If you happen to find us in Bahia Concepcion and want to drop by for a visit, you may want to call before you come. Odds are that I'm going to be buck naked with a spritzer bottle in hand and sitting by a fan. I'm pretty sure that's something you're not going to want to see. As you can clearly see, it's hot here. 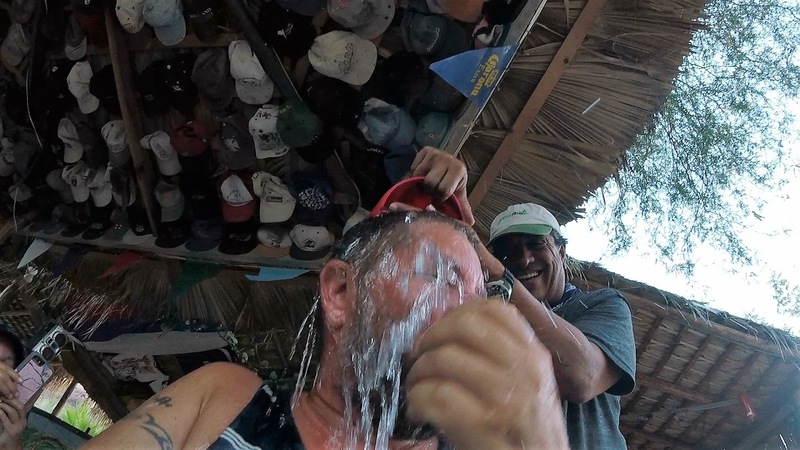 When you ask if there is A/C at the local restaurant in Bahia Concepcion, the answer is "yes", and then a bucket of ice water gets sneakily dumped on your head when you aren't looking. Brenda loved it and asked for more. Don't worry, I got one too. And of course, here's another one of our highly educational videos. Our little floating home is a 1982 Cooper 416 pilot house sailboat. The Boat is 42' long and 14' wide at her widest point. She is a good boat. We named her Adventurer. She was made on Vancouver Island by a bunch of crazy Canadians back in the early 80's when apparently shag carpet was in style. They put that shag on everything...the walls, the floors, they probably would have put it in the fridge if someone would have let them, just to keep the Molson's from clanging around.